Despite a scathing review from Consumer Reports, Cars.com remains totally behind the Toyota Prius C.
Consumer Reports sparked some controversy earlier this week with their less than complimentary video review of the all-new Toyota Prius C. The review, which included words like “cheap” and “lackluster,” went as far as advising consumers to purchase a used regular Prius over a new Prius C. Consumer Reports gave the Prius C a less-than-stellar overall rating of 53, setting it near the bottom of its class. Despite Consumer Reports’ disappointing test scores, Cars.com had an entirely different impression of the compact full-hybrid vehicle. According to Cars.com, "If value proposition were the 2012 Toyota Prius C's only feat, it would likely still be a sales success, but the mini-Prius is also surprisingly roomy — and has a comfortable ride and an impressive array of standard features." Cars.com also contends that the vehicle’s price is reasonable, in spite of Consumer Report’s contention that it is too expensive. 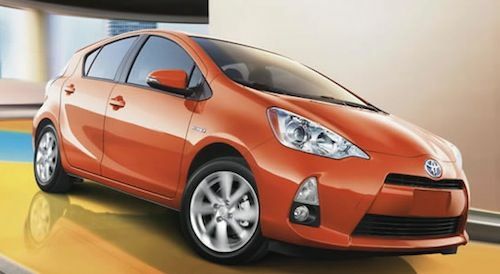 Cars.com argues that the Prius C base model, which is $19,710, is very well equipped and is competitively priced versus other subcompacts. In fact, the Prius C bested every vehicle in its class except the Nissan Versa when taking the cost of fuel into account. The Prius C also surpasses the Chevy Sonic and Honda Insight in affordability, even after adding an extra $950 for the Two trim level. In order to avoid favoritism claims, Cars.com indicated that it is not in the bag for Toyota. Cars.com did not choose the Corolla as a Best Bet due to its poor driving experience. The site also gave poor reviews to the Toyota Highlander and Toyota Sienna. Cars.com has yet to bestow its Best Bet title upon the Prius C, because there is no reliability data currently available for the vehicle. The Yaris, on which the Prius c is based, is a lackluster car in comparison to other choices. As for value for money, Consumer Reports does say you get what you pay for. I suppose that can be interpreted two ways. I've sat in Prius c. It's not luxurious by any means, but it's not intended to be a luxury car. If you demand that, you have to pay twice as much for the baby Lexus CT200h hybrid. It will be interesting to see if Honda can do any better with its answer to the c in 2015. I too love my prius C. My experience is in line with yours in that I get 5-10% higher mileage than the EPA rating. It is rather slow, but it does get on the highway fast enough and has plenty of acceleration from 0-30mph when I need it in the city. The interior materials are definitely less plush than other cars of the same type, but the seats are very comfortable. Toyota does a great job in adding style to these materials. I find that the fit and finish inside is very good. Controls feel very solid compared to the Chevy Aveo and Kia Soul. I'd say that the materials are on-par with the Mazda 3, the Fiesta and the Focus. All this is to say that I agree with Consumer reports in that I did get what I paid for: quality, efficiency, economy. Reviews are highly subjective. I own one and love it. 56 MPG City and 50+ HWY It accelerates as required and is comfortable enough to drive several hours non stop so the opinions offered by Consumer Reports are just that, one mans opinion and he doesn't own one. Well, I do own one and like it well enough that I'll probably buy another one next year when my lease on another car comes up. I own it and love it so much I already have 4k miles on it, I average 55 to 60 mpg city and since i get such good mileage, i don't really do highway unless i am in a real hurry and I may get 46 to 50 mpg depending on traffic. No car is ever perfect, there are things that I would like to change from the glare on the navigation screen to the lady who doesn't understand what i'm saying sometimes. I have the 4 model with moon roof, softex seats, and navigation. This is my first prius, having owned honda's before I zip zag and often break the law when i'm hypermiling on the streets getting to and from the places i'm going. Its not a race car but it gets me there and its really fun to drive. You do get what you pay for but, all cars decline in value regardless of quality I see many Mercedes benz's selling for cheaper in used car lots than there original price regardless of them having leather seats and higher trimmings, its the nature of the game.. Car's don't increase in Value like homes do they always go down, with every new car that comes out each year. I personally love my Toyota Prius C, and hope to enjoy driving it for many years to come. I'm in the same boat as everyone else. I'm very happy with my Prius C. It's getting 52 MPG in mixed city/highway driving. And it's more comfortable than the standard Prius that we also own. I have a Prius C and have no complaints so far. I own a Cadillac SRX, so I have no need for size, or luxury, as i simply wanted something for my day to day commute that got excellent gas milage, and had enough features that I wouldnt mind rush hour stalls (I live in Los Angeles). So it meets or exceeds every expectation to this point. I am with Cars.com, in that I completely disagree that its better to buy a used Prius vs the c. I was initially in the market for a used prius, and at the price points I was willing to consider, I ran into the following issues: 1 - The Prius was too old (2008 or older) 2 - It had too many miles on it 3 - It lacked features (such as nav or sat radio) One dealer was selling a 2010 Prius with no Nav, no Sat radio with cloth interior for the same price I got my Prius C model 4. Granted, this particular Prius had very low milage (10K), But if I could get more features on a brand new car at the same price,and size doesnt matter (again, I dont need alot of space in my commuter vehicle) Why not get the C? I traded my 2008 Hybrid Camry, with all the bells and whistles for my Prius C 4. I no longer needed such a large car, despite its contant 39 MPG. My "baby Prius" purrs like a kitten on the open road, and while not a formula 1 race car, it gets me on the highway safely every morning, and with the nice softex seats, quite comfortablly. Consumer Reports is not always right. My Camry, when it came out was not a best buy. They eventually saw the error of their ways. In time they will love the "baby Prius" as much as its owners do already. Especially at 58 MPG! Love my Prius c. Interior is big enough for wife and two young children (and a duffel bag - trunk is tiny). It is our urban commuter. It does not accelerate great but it is plenty enough to get on the interstate and move out of the way when necessary. Handling is a little noisy, it rides rough, and at 80+ mph the ride gets a little weavy.. but the MPG stays way up there. Around town we frequently get 50+. Highway miles cause it to dip a little, into high 40's. Driving it like a teenager in a go-cart (it's very much a go-cart), it will still get over 40 mpg. (pedal to the metal all the way, breaking speed limits). It corners better than many "sports" cars.